At the core of any form of yoga is the practice (or sadhana). May it be working with the body, the mind, the emotions, or breath. Often we go at it alone to go deeper within, learning to face lifes challenges and to love life and ourselves more. What if we took the power of practice a step further and into our relationships? All sorts of interesting things start to happen – trust, authenticity, communication, and fierce love, to name a few. It would be naïve to not recognize the ups and down’s of a partnership as well but, that’s where a practice comes in. 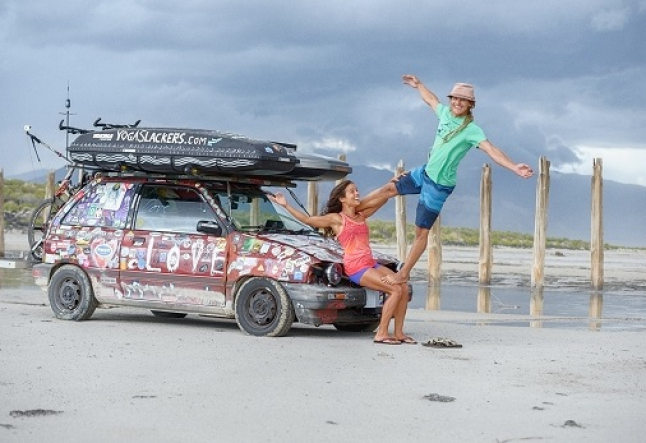 Sam Salwei and Raquel Hernández teach AcroYoga and Slacklining and are known for bringing their students to their edges and beyond. As modern day nomads, they can be found driving coast to coast, or hopping on a plane to teach overseas. Sam is the co-founder of the YogaSlackers, and has a great deal of knowledge and experience on the slackline, creating amazing spectacles wherever he goes. Raquel's extensive training in different types of Yoga, AcroYoga, and Slacklining, makes her a motivating and receptive teacher, great at progressing her students further. With their many combined talents and skills, these two always have something new and exciting to share and together, making them the perfect team. This interview is an exclusive opportunity to hear firsthand from inspiring couple Sam Salwei and Raquel Hernández given us a real, raw insight into their relationship and the power their practices play in expanding it. Kendra for YOGI TIMES: What are the practices you do together? Raquel Hernandez: Most of the activities we do, we do together. Yoga, mountain biking, climbing, running, slacklining and acroyoga are the most common. We decided to travel and live together because we share so many common passions. There are just a handful of things we don't do together: kitesurfing and swimming. But even then, we accompany each other to our desired activities. K: How would you describe these practices to someone that has never done them before? Raquel Hernandez: We practice AcroYoga and Slackline Yoga. As strong yoga practitioners, we find and practice yoga in our daily activities. 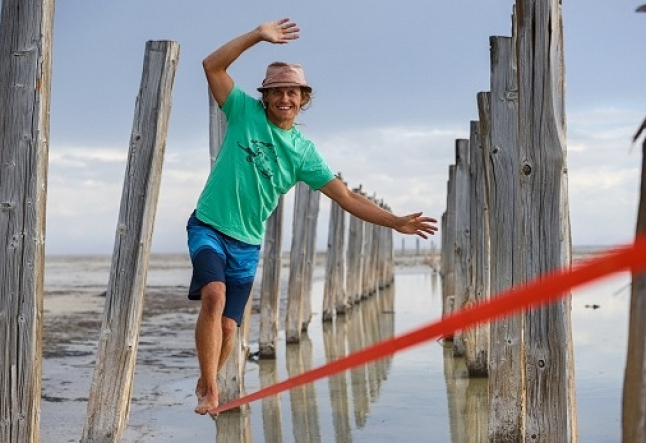 It is very easy to take our practice - literally - off the mat and onto a person or a slackline. AcroYoga is a practice about communication and play. It involves one person acting as the ground (the base), a person doing yoga on top of the base (flyer) and a person keeping this union safe (spotter). Since it involves other people, the practice is grounded in communication, community and play time. We find it is a great way to connect with others in a playful way. Slackline Yoga, is a reflection of our energy. We are practicing yoga on a very thin yoga mat, one inch to be exact, and this provides instant feedback to the energy we put in. This 'yoga mat' or slackline moves with our body and therefore is a reflection what our body is doing. If we are stressed, tired, unfocused or unbalanced the slackline will let us know that very fast! We often describe Slackline Yoga as a very sincere practice. Every day that you step onto the line, the line will treat it as the first. It doesn't matter how 'advanced' you are. The line treats you as a beginner and adds new challenges to your practice and more importantly, shaking all the worries out of your body in just a few minutes. K: How long have you been doing these practices together? Raquel Hernandez: Sam started practicing in 2004 and Raquel started in 2010. We have been traveling, training and playing together since 2012. K: Of these practices, which one has been most powerful for learning more about one another and deepening your relationship? Why? Raquel Hernandez: AcroYoga is the most powerful tool to learn about each other. As an individual, AcroYoga teaches about communication, expressing your needs and making requests in a non-violent way. Being conscious of your communication needs, this could happen with anyone you play with. However, when you add a partnership of any kind - the dynamics are different and to a certain point become magnified. When working with a stranger people tend to have a filter and be nicer, softer and more patient. This filter tends to disappear when working within a partnership. The trick is if it’s used correctly, this unfiltering can become a real magical moment. Once the filter is gone, people begin to show their real self. 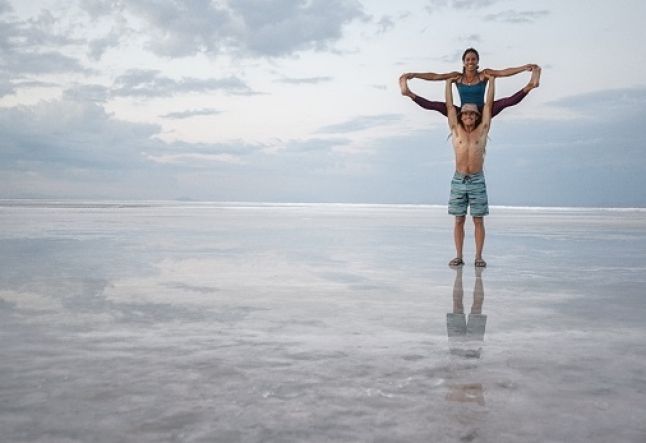 If they are conscious of using AcroYoga as a tool to become better at communication, the practice can truly work wonders for their relationships. AcroYoga in our partnership serves as a magnifying glass exposing our current mood, it sees right through most filters. If we are aware of it, it can be a wonderful thing that brings us closer. If we are not, let's say that we will crash rapidly. K: What are the strengths in your relationships and connections in life and with each other? Raquel Hernandez: Life on the road can be very challenging for couples. It becomes a real 24/7 relationship. There are no alone moments at all. For this to work, you REALLY need to like each other on all levels - that is our biggest strength. We like most of what we do and we like to do it together. Companionship and a friendly nature keep our relationship sane. K: Do you correlate your strengths with the practices you do? If so, how? Raquel Hernandez: Yes, our relationship is a test on commitment, communication and trust. It is very similar to an alone yoga practice, where the time spent on the mat (commitment) allows you to know yourself better, to communicate with yourself on a deeper level and to trust your own instincts. Similarly, Slackline Yoga allows both of us to challenge ourselves while having fun. AcroYoga on the other hand, provides an opportunity to test our compassionate speech, our connection and trust. K: What are the challenges in your relationships and connections? Raquel Hernandez: One of the biggest challenges is having 'couple time'. We are together all the time, but we might be teaching a lot, traveling with other people or just moving too fast to have some intimate time. Most people think we have enough time with each other, while in reality we are aching for some quiet, alone time. It has taken us a few years, but we are learning how to say no to extra commitments and yes to our relationship. K: Keeping your challenges in mind, how have you used your practices to work through them or nurture them? How did they affect your practices? Raquel Hernandez: We test our relationship daily by spending all our time together, teaching together and playing. We see each other a lot more than any other person. We see our good and bad days. There are no 'days off or time-off' from each other. This means that we need to really see and treat each other with a lot of compassion. Knowing that we still love each other regardless if we had a bad day, or a stressful situation. This comes in forms of speech, acts of kindness and offers of support. I used to make yoga as my 'reset button'. If I had a bad day, I could step into the mat and make it all better. We use a similar idea for our relationship. When there are too many bad days in a row, we need to find our relationship reset button. Luckily we share so many common reset buttons that it tends to happen with spontaneity! K: What are the benefits or skills you have gained in your relationships from your practices? Raquel Hernandez: The biggest lesson we have learned from both Slackline Yoga and AcroYoga are: First, asking ourselves what can we do better and identify our needs. Second, to look into each other's eyes and question what do they need and how we can help them out, particularly when the other might not be able to express their needs on their own. K: What inspires you about your practices together? Raquel Hernandez: What inspires me the most is that they are a practice! It is an ever evolving, growing and expanding set of skills we choose to do often. We do not consider ourselves masters of anything or to have the perfect relationship. Just as all the other things we practice, we need to step onto the mat, the slackline or our relationship with only the present moment in mind. If we focus too much on the past, we will most likely put too much pressure on it due to high expectations. Instead, the constant reminder to have a beginner's mind, a beginners gentleness and the playfulness of a child, makes us enjoy the entire process and to come back to it day after day. K: Do you have advice, resources or relationship mentors for any relationship may it be business, family, friend, lover, etc. to grow and thrive? Raquel Hernandez: I recommend checking out GlobalGlueProject.com. Their goal is to help people stick with their relationships. It is a great tool to meet couples with relationships of all lengths. For us, it’s very empowering to know that there are other couples going through similar struggles. It is very easy to feel like we are the exception. Finding a support group, friends that are in relationships that are open enough to speak about their struggles and their ways to work around them, are a huge help. Find a community that supports your personal and relationship growth. K: Who has been your greatest teacher(s) for your practice(s)? Raquel Hernandez: Our students have been our greatest teachers! Students are a clean mirror of our practice. If they are not getting something, is because we haven't been clear enough. If they are talking harshly to each other, it is because we have been modeling that or because we haven't addressed it in time. When we teach a class or workshop we learn as much as our students do and probably more! K: What are three nuggets of wisdom that could be applied immediately for the readers that you have for relationships? Raquel Hernandez: Ask yourself what you can do better. Ask what your partner needs. Love your partner and yourself one day at a time.